The Dolphin Swim Tour in Anguilla provides an intimate experience with dolphins without large crowds of people. Up to 12 people are included in each group. Guides will deliver a 15-minute briefing before guests are allowed to interact with the dolphins for 30 minutes. Activities you can experience with the dolphins include hugs, boogie pushes, kisses, hand targeting, belly rides, and handshakes. The Dolphin Swim tour in Anguilla consists of a 15-minute briefing to ensure a safe, fun experience and 30 minutes in the water playing with the dolphins. 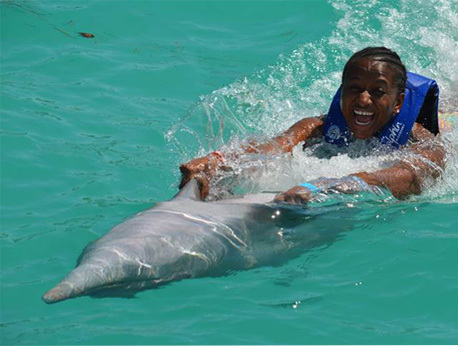 During the Dolphin Swim, you can experience a hug, belly ride, kiss, handshake, boogie push, and hand target with one of the cute dolphins. You probably already know what a dolphin hug, kiss, and handshake are, so we'll explain what you'll experience with a belly ride, boogie push, and hand target. During a dolphin belly ride, you hold onto the dolphin’s flippers as it swims backwards. In contrast, the boogie push involves a dolphin pushing you across the water while you lay on a boogie board. Hand targeting is when the dolphin touches its nose to the palm of your hand under the guidance and special training techniques of our trainers. One of the benefits of the Dolphin Swim in Anguilla is groups are limited to 12 people so that everyone can enjoy a closer experience with the dolphins. You will be able to spend more time with the dolphins without a large crowd of people. Guides will share interesting facts about dolphins during the Dolphin Swim program, so you will return home with a combination of new memories and knowledge. For example, dolphins have great hearing and eyesight with the ability to locate objects via echolocation. Transportation to St. Martin can be found via a ferry service. The ferry departs every 45 minutes from Anguilla, however, this schedule is subject to change without notice. This transportation service is entirely independent from Dolphin Discovery. Photographs with the dolphins, food and beverages, dock fees, and transportation fees are not included with the Dolphin Swim Tour in Anguilla. Guests are responsible for their own transportation and food after the event. Don't eat too soon before the Dolphin Swim as it may upset your stomach when you go into the water. For your convenience and to avoid frustration, please bring your passport and visa to the location because the migration department at the entrance may ask to see documentation before allowing you inside. Ferry departures are every 45 minutes. From St. Martin to Anguilla departures start at 8:15 a.m. and finish at 7:00 p.m. From Anguilla to St. Martin the first ferry departs at 7:30 a.m. and the last one at 6:15 p.m. The ferry schedule might change without previous notice. Dolphin Discovery is independent from the Ferry Company.